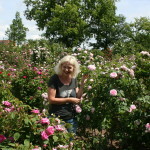 Translation of the essay about my visit in June 2013 to the Europa-Rosarium Sangerhausen, published in the November 2013 issue of the ‘Rozenbulletin’, the periodical of the Dutch Rose Society. For as long as I can remember I’m crazy about roses, but experience and the possession of roses had long been confined to browse rose catalogues, rose books and websites, for it is hard to keep roses on a balcony (or a North facing garden of only 15 square meters). The starting five years ago with an allotment proved a lucky shot, and soon the roses there prevailed, turning a mere hobby into a true passion. 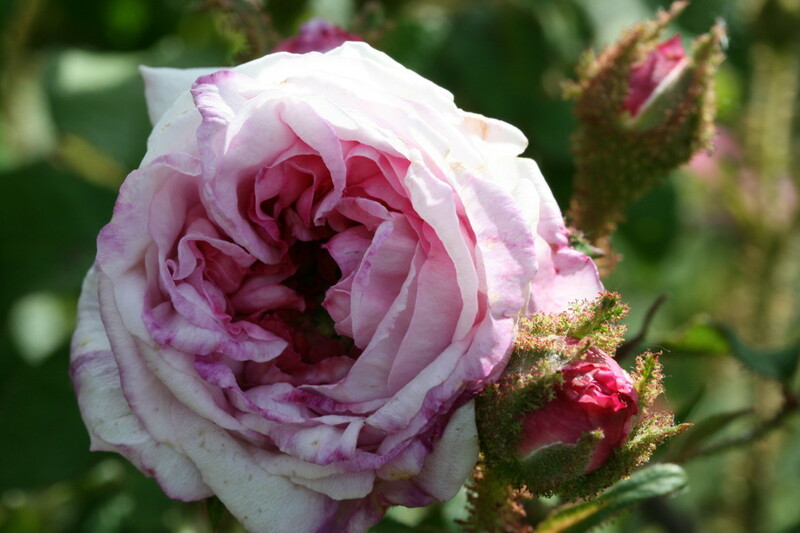 My love for roses focuses mainly on the historical roses, like the gallicas, albas, centifiolias and moss-roses. Due to to the internet and social media I came in touch with rose growers and rose lovers from all over the world. Sadly the few rosaria I had visited in the Netherlands could never really fascinate me, probably because of the lack of old roses. My curiosity was aroused by stories I heard about the Rosarium in Sangerhausen and the many old roses that could be seen there. Contact with a friend who works there, lead to plans to visit the Rosarium in mid -June, the time that most old roses would be in full bloom. Even better was it, when I heard that my visit would coincide with the 13th International Heritage Rose Conference in Sangerhausen. The planned week grew into a 10-day trip to this (as it turned out) beautiful Rosarium, combined with the lectures of the Heritage Rose Conference. 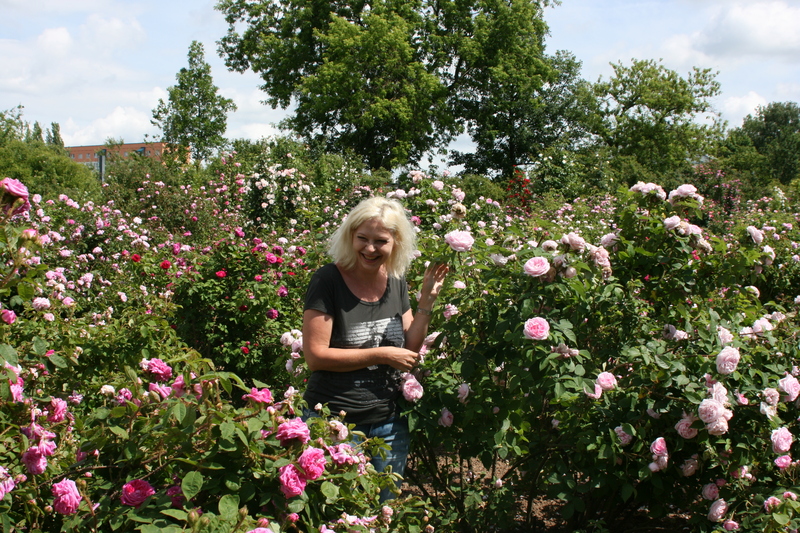 In the Bulletin of the Dutch Rose Society several articles allready have been written about Sangerhausen, but it cannot be said enough that this truly is a rosarium that every real rose lover should at least have visited once in his/her life. Even eight full days in the Rosarium where barely sufficient to see all the roses. My first encounter with the part where the old roses grow, was love at first sight. I thought I was walking in heaven! The enormous quantity of special and rare roses, the colors and the clouds of fragrance. This surely is a place that I will be visiting the coming years many more times. The surroundings of the current main entrance to the Rosarium is not really to my taste, but is of course suitable for the large number of tourists who visit the Rosarium. It is broad and mostly planted with modern (brightly colored) roses. The old city entrance on the other hand, where also many old roses are planted, offers a more ‘romantic’ view of the Rosarium and is definitely worth to take a look, and so maybe walk into the town itself. 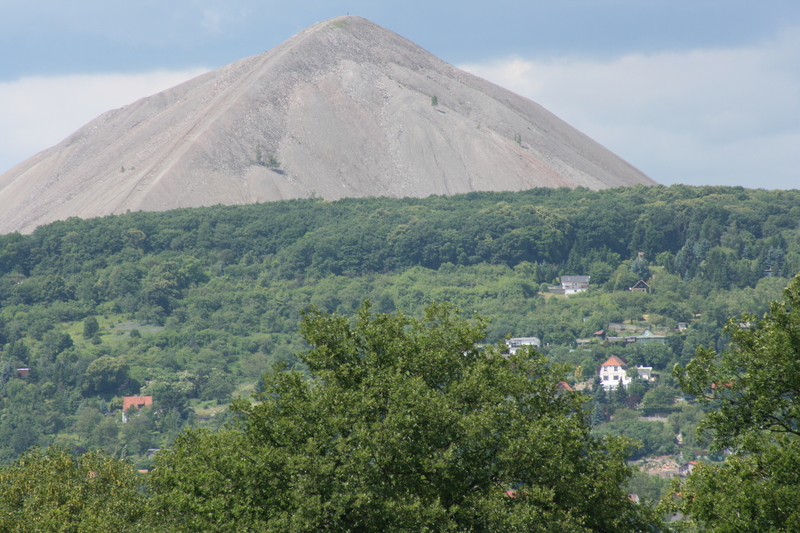 The visible bare copper ore mountains are characteristic for Sangerhausen and beautiful to see. On Wednesday, June 19th was the registration for participants of the conference and a welcome reception with the Mayor of Sangerhausen was held. Thursday, June 20 was the first day of the conference with lectures by Thomas Hawel (Germany, Europa Rosarium Sangerhausen – Collecting and Maintaining Heritage Roses – Concept of a Genetic Rose Bank), Andrew Roberts (England, Ploidy determination as an aide in the identification of relationships between historical roses), Guoliang Wang (China, A legacy of Chinese Ancient Roses in Song Dynasty) and Charles Quest-Ritson (England, From Hybrid Perpetual to Hybrid Tea). Other speakers at the conference were: Helga Brichet (Italy, Rose Gardens in Italy), Paul Zimmerman (USA, Historical Roses in America – New Beginnings in a New World) unfortunately unable to come and substituted by Steve Jones, Patricia Cavallo & Dominique Massad (France, Nabonnand Roses), Odile Masquelier (France, Historical personalities whose names were used to baptize roses), Helga Brumme & Eilike Vemmer (Germany, Identification of Historic Roses according to ancient Rose Depictions), Ann Velle-Boudolf (Belgium, Hybrid Musks) and Pirjo Rautio (Finland, Historic Roses in Finland). About the first lecture, the one of Thomas Hawel, director of the Europa-Rosarium Sangerhausen, I would like to tell more, mainly also because I found the background information about the Rosarium so very interesting. The following contains a summary of his lecture. With the introduction of Chinese garden roses in the beginning of the 19th century a new era started for the European rose cultivators. Qualities like the recurring bloom, noble blossom shape and new color shades revolutionized the European rose world. This entailed that numerous new rose varieties were put on the market. The demand for ancient garden roses decreased perceivably, many well tried types of roses vanished completely. In 1897 Peter Lambert, a rose cultivator from Trier, suggested the foundation of a club rosarium with the aim to act on the distinction of well-tried rose species and rose varieties in order to preserve these for posterity. Due to the commitment of the “Sangerhäuser Verschönerungsverein”, they succeeded in opening the Rosarium in Sangerhausen on the 3rd of July 1903. The assortment consisted of 1.500 different roses, which were planted on an area of about 1,5 ha. Through the mediation of Peter Lambert various ancient roses from the famous rosarium Roseraie de L’Haÿ near Paris were brought to Sangerhausen. 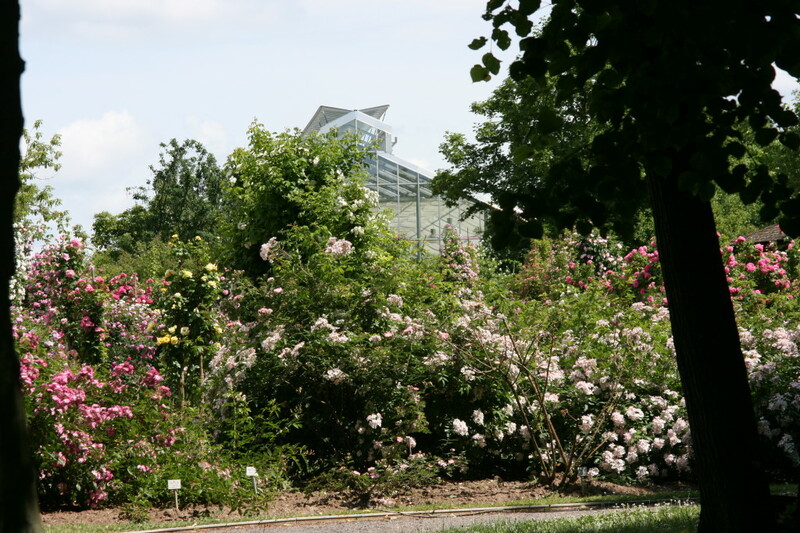 Likewise from France, the wild rose collection from the German botanist Dr. Dieck, which was planted on the occasion of the World Exhibition in Paris, was integrated into the Rosarium. The location Sangerhausen succeeded to become the central venue of rose research in the year 1935. Up until the year 1944 under the direction of Dr. Harald von Rathlef tests on species and research was conducted. After the Second World War the rosarium was municipally operated by the city of Sangerhausen. Due to the high personal commitment of the respective people who were responsible for it, it was made possible to keep the rose assortment and continuously extend it. With the reunification the Rosarium gained an all-German and European significance. 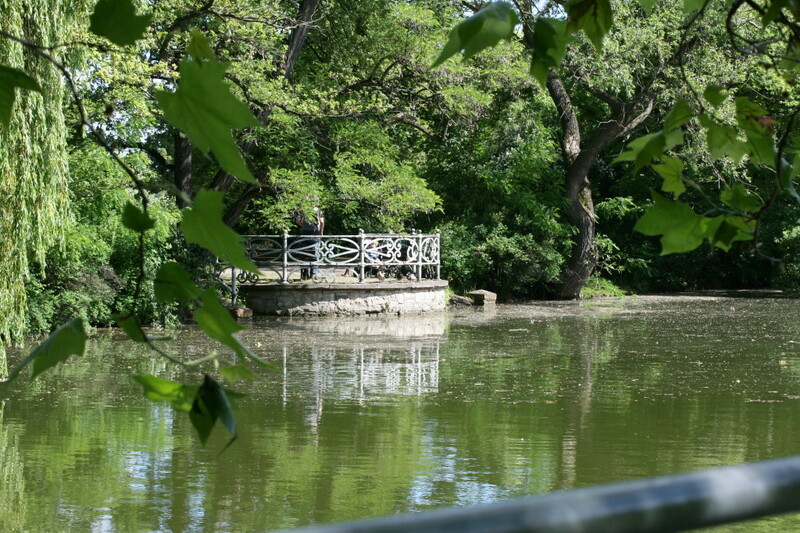 For the 100th Jubilee in 2003 it was achieved to expand the Europa-Rosarium in several areas. 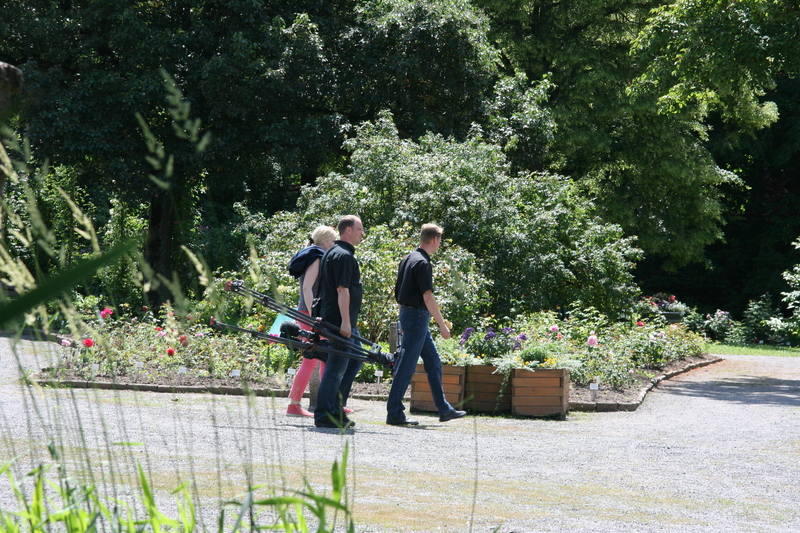 A new entrance area was developed, another wild rose garden as well as numerous theme gardens. In the area of the main entrance the “Information Centre Rose” with a glass house was accomplished. 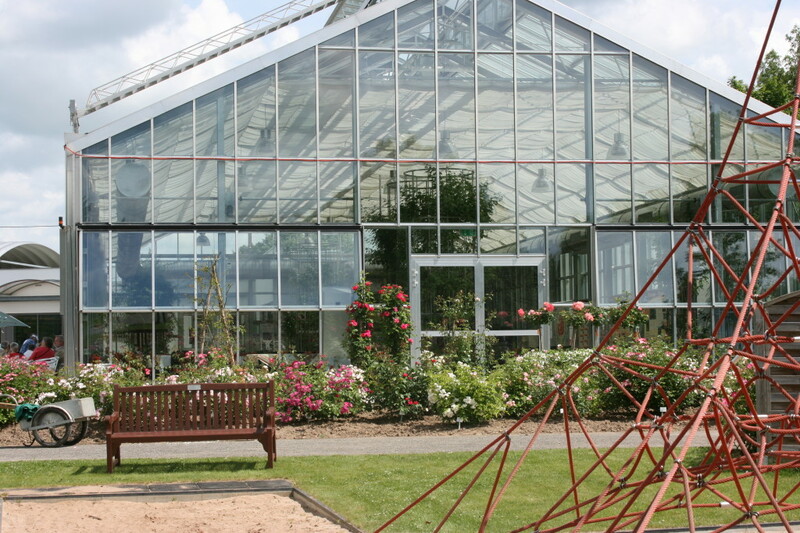 In the glass house roses are showcased which in the latitude of Sangerhausen are not sufficiently resistant to frost. In 2009 the Europa-Rosarium, as first institute in Germany which is specialized on the preservation of an ornamental species, received the title “German Rose Gene Bank”. In the same year it was possible with the help of the GRF-Foundation and the supporters club to open the “New German Rose Library”. [At the end of the second world war, in 1947 the entire collection of the Rosarium Sangerhausen was to be budded for the rosaria of the Academy of Sciences of the former Soviet Union in Kiev and Moscow, and the new plants were transported a year later to Russia. Of not grown cultivars one or two adult species were excavated from the rosarium and taken over to Russia. Also the complete library of the Rosarium was brought over to Russia as war damage payment. The loss of the library today is still noticeable by the fact that some roses are included under a wrong name in the Rosarium. Only by paying hefty amounts Russia would be willing to give – parts of – the original library back. Rose experts from around the world aide regularly at the identification of some of these mislabeled roses, and at the end of the conference several old roses were labeled with orange tags, on which were written the supposedly correct name of the concerning cultivar]. The Europa-Rosarium Sangerhausen is most likely the oldest, based on its original intention, fixed and specialized on a living plant collection in Germany and is a historically grown public garden. The location Sangerhausen with an altitude of 170 meters above sea level has a continental climate with minimum temperatures below -20 °C and relatively dry summers with an average annual rainfall of about 500 mm. A rosarium differs basically from pure viewing gardens in its intention. Its aim is the preservation and extension of a systematic collection, according to scientific criteria. Even roses which according to a subjective standard like the aesthetic, their resistance against diseases, as well as stress tolerance, which are less suitable, are consequently kept in the collection. [and thus prevent further cultivars to disappear]. This means in practice a heavy work load. Super sensitive roses need often annually to be grafted anew. The grafting is done on commercially available rootstock. To maintain the collection in Sangerhausen annually about 14.000 roses are being grafted and then in considerable necessity planted out. The representatives of the wild roses have been multiplied in the recent years through root cuttings. [Many of these (rare) roses are also sometimes for sale in the shop at the entrance of the Rosarium]. The main attention of increasing the assortment lies in the completion of the species of heritage roses as well as the wild roses. Because of the great number of annually appearing novelties of modern roses, mostly European and there-of in particular German cultivations are integrated into the stock. This pre-selection is necessary as only limited space and operational capacities are compatible. Especially the lack of available planting-grounds causes an increasing problem. For this reason combinations with perennials or annual mixed borders is omitted. All changes in the rose assortment are being documented and continuously developed in a rose data bank since 1995. It also includes photo documentations, botanical features of the individual acquisitions, details about the grafting which took place, as well as comments of external experts. An important work paper, as well as for staff members of the Europa-Rosarium, as for outsiders, is the in regular intervals published “Sangerhausen Rosenverzeichnis” (Sangerhausen’s Rose Index) printed as a booklet. Gene banks of cultivated plants are sustainable and with an eye to their usage ex-situ collections (away from their natural habitat) of intact vivacious plants. Throughout Germany the first gene bank of cultivated plants, affiliated with the collection of the Europa-Rosarium, the genus Rosa was elected. One of the most important tasks of the gene bank Rosa consists further on in the verification of the collection. There for up to now about 3.500 single proof tests were conducted, a herbarium with about 4.100 exemplifications was put together and over 40.000 photo documentations for export into the rose data bank were assembled. The rose data bank forms an elementary base for the gene bank’s suitable development of this very specific documentation system of the Europa-Rosarium. I found the lecture by Thomas Hawel very interesting, in showing the special nature of the Europa-Rosarium Sangerhausen: a living history of the rose.